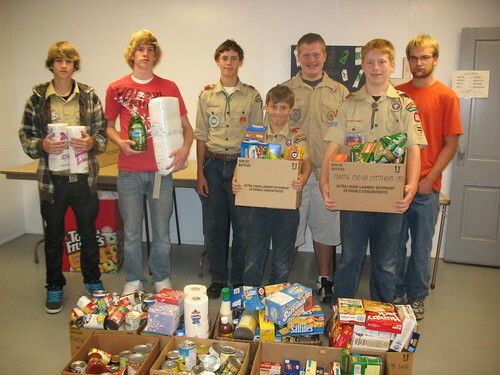 The Boy Scout troops and Cub Scout packs of the Central Minnesota Council held their annual Scouting For Food Drive on Saturday, October 9. Thousands of Scouts, leaders, and parents assisted in making this event a success. It is hard to believe that this “national good turn” began way back in 1988, twenty two years ago. Pack 68 and Troop 68 of Melrose used to share in the work for the drive. The pack would distribute the bags one Saturday, and the troop would pick up the bags the next Saturday. Unfortunately, the pack has fallen on hard times and does not have the membership to distribute the bags, so it has fallen on the troop to distribute them and pick them up again. And unfortunately, the troop is down to eight boys so we were not able to distribute the bags over the whole community either. Has your pack and troop already conducted their food drives? How much food did you collect?